This journal documents our process of getting a new truck: all the ups and down, the trials and tribulations, the dead-ends and inspirations. If you're not already pretty familiar with our situation, it'll probably make more sense if you read about our old truck first. After driving tiny-to-medium-sized cars for six weeks in Britain, we return to our overloaded F-350 and make the mistake of setting off north on California Highway One. You know, the one that follows the coast like an eel. Well, the contrast with the responsive cars in England, combined with the continual turns and horrendous camber changes, quickly convince us that we've lived with too small a GVWR for way too long. The "someday" when we'd get a bigger truck has just gotten a lot closer. This truck isn't happy, and it isn't safe. We make it about 50 miles before we turn inland in search of straighter roads. While hiking in Lassen Volcanic National Park, Teresa and I realize that the truck we need just might be within our financial grasp - right now. We resolve to start things in motion; she begins searching online marketplaces for the right truck, while I set about nailing down all the unresolved questions about putting it together. At this point, I'm quite liking the look of the Rawson-Koenig U60D88 utility body. Claimed to be the same height as a pickup bed's frame rails (19"), this DRW body has a 59"-wide bed (should be plenty). but an overall width of only 88", which I think is narrow enough to fit within the Lance's tie-down points and buttresses. I need to do some measuring. 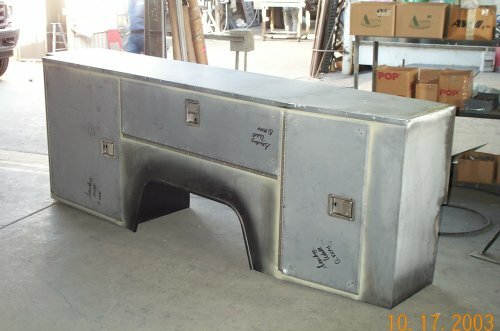 They're also nice enough to put the weights of their bodies on their website - this one is 1147 pounds! I put together a list of questions for Rawson-Koenig, to be asked as soon as we get close enough to a cell phone tower. We finally hit phone coverage in Burney, CA, and I call Rawson-Koenig from a Safeway parking lot. 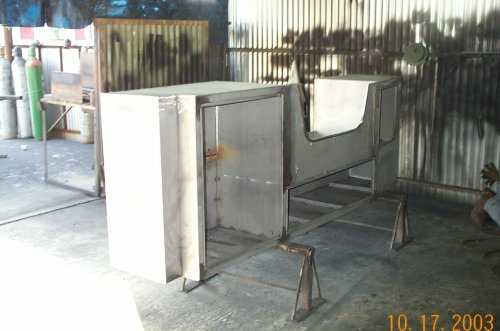 The guy I talk to is a bit confused about what I want to do with their truck body, but before long we establish that the 88"-wide body is for older trucks; for the late-model F-550 we have our eye on, a 94"-wide body is needed, which negates all the advantages I saw to the narrow body fitting under our Lance without significant modification. As we drive out of Burney our heads are reeling with other options, but the top of the list settles out to trying to find a body manufacturer who will build one to suit our needs. Other issues remain unsolved. Here's an example: A pickup like ours carries its spare tire under the rear of the frame, but an F-550 puts its fuel tank there. So where to carry a spare? 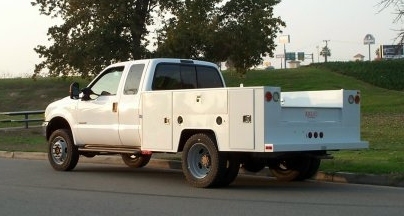 You can attach a pickup-style carrier under the rear, but then the fuel tank will need relocation. Now, Transfer-Flow makes a 57-gallon midship tank for SuperDuty pickups that hopefully would also fit an F-550, and would slot in nicely with this plan. But an e-mail exchange rules that out as incompatible - the biggest that will fit is 34 gallons, smaller than we'd like. So I'm inclined to keep the stock tank and put the spare in the "extra foot" a 9' utility bed will have in front of our 8' of camper. [A 550 has at least 9' of frame rails behind the cab; our camper is made for pickups with an 8' bed, hence the "extra foot".] 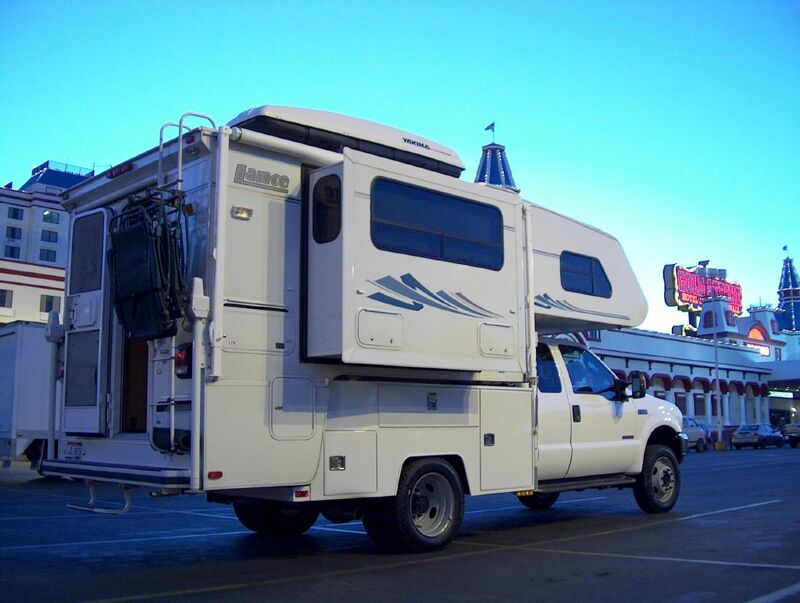 Ideally, the body company would build us a compartment there for it, accessible from the side so that we could get at the spare with the camper on the truck. Otherwise, we'll skip the front compartment and just bolt the spare in the front of the bed, but then we can only get at it by removing the camper. See what I mean about issues? 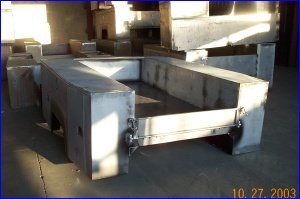 I initiate e-mail contact with Douglass and Diamond, two small truck-body manufacturers here in California with whom I'd spoken last summer about building us a utility body. Both have some prior experience with building bodies compatible with campers, and both seem quite willing to work with us to do so now. I describe roughly what customizations we'll need for the camper to fit, and both consider them very doable. Initial price estimates come in around $5000 from Diamond, $7000 for Douglass. We decide that the utility body is a big enough piece of our fulltiming future that we don't want to buy one sight unseen. So via e-mail from Whiskeytown NRA in northern CA, we arrange meetings with both Diamond and Douglass for next week. I start assembling a list of questions for each, covering most of our unknowns regarding the body and its construction. 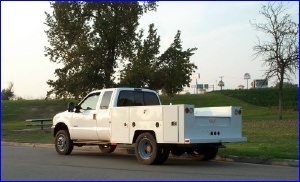 We've found several used trucks that look likely on the Internet, mostly through TruckTraderOnline.com. E-mails to the car dealers that have them produce very little result, however; I think these dealers are still pretty much in the technological dark ages. After a nice weekend in and on Whiskeytown Lake, we've driven 4 hours south to the Light Industrial district of Stockton, the home of Diamond Truck Bodies. We're met out front by John Cooper, who shows us some of their product's features and answers most of our questions. We even go so far as to detach the camper in their yard so he and his boss Mike can take measurements. Overall, they seem to have a pretty good plan for resolving most of our issues, but we spot a few things they've missed - like where our front jacks will swing into when sitting atop a 94" wide truck body. John also tells us unequivocally that the spare won't fit within the body compartments; at 32" diameter, it's just too big. Still, we leave with more answers than we had questions, and feel pretty confident that Diamond could build us a body that would work. They're open to doing whatever customizations are needed, but of course they charge for each one - by the time we do the mods that are necessary, plus a few more that we'd like, the price will probably be up near $7000 here too. John promises to fax us a final quote in a couple of days. We're not having much luck actually finding a used F-550 that matches our requirements. Two main problems: First, these tend to be serious work trucks, and don't get traded in or sold secondhand very often - more frequently they're simply driven until they drop. Second, what we want isn't what most companies that buy these trucks new want; for example, here in sunny California, 4WD trucks are much less common than in snowy Colorado or the upper Midwest. And our preferred SuperCab is a bit of an orphan in the model lineup; if buyers want a back seat, they usually opt for the bigger Crew Cab, or if not, they get the cheaper Regular Cab. Some soul-searching tells us that getting the right truck is important enough that we just might pay the $40k+ for a new one if need be. Four more hours south puts us in Bakersfield, where we stop in to see Douglass Truck Bodies. It's a tiny bit offputting initially - we have to wait to see Bob Hennick, rather than being met outside as we were at Diamond - but on an impromptu shop tour, we soon realize that their product is considerably more refined than Diamond's. They also seem more comfortable with camper-specific customizations; for instance, they have specific proposals for attaching the camper to the body, rather than Diamond's "We'll work something out" approach. And though Douglass' base price is higher, their customization charges are lower, leading us to suspect that the final prices will be quite competitive. Our instinct is to choose Douglass, and we're confident enough about this that our next stop is Jim Burke Ford (also in Bakersfield), where we're received by Jason Hooe in Fleet Sales. 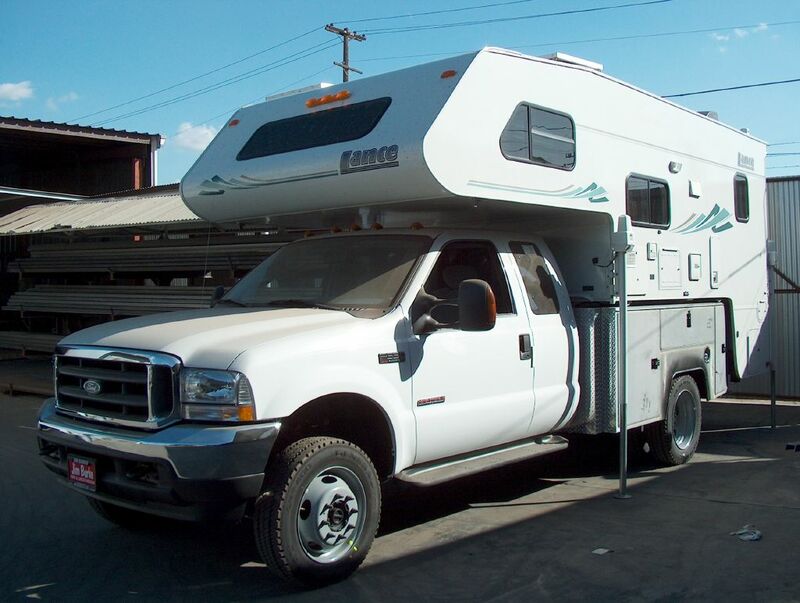 At our request, he conducts a nationwide inventory search for a 2003 F-550 matching our "must-have" list - and comes up empty. This truck is even rarer than we realized. Undaunted, Jason proceeds to draw up a quote for ordering a 2004 to satisfy our every whim. Retail price: $47,000. Yikes! Definite sticker shock. We tell Jason we'll think about it, leaving him with one of our Where-RV-Now "business" cards. Later, the utility body quote from Diamond comes in at $7327, confirming our suspicion that we can get Douglass quality and know-how for a comparable price. We'd left Douglass with what we thought was a good solution to our spare tire problem, a tall front cross-compartment (akin to the one I'd dreamed up) that Bob called a "saddle box". But a Friday-afternoon e-mail from him says he's run into a snag, that this won't work. We're not quite clear why, but it's Saturday before we get it, and since we can't call him we come up with another harebrained solution of our own: what about a narrower box on one side of the truck, and we'll hang the spare on the outside? A bit of a kludge, but it has some appeal to me - that's a cool look, sortof like an old Land Rover crossing the Serengeti with a spare on the hood. But the bottom line is that we consider a spare tire to be a necessity. I draw up some designs. A word about cab size is probably in order here. It relates to overall length; our current rig is 24'2" long with the camper on a SuperCab (think of it as a pickup with half a back seat). The bikes hanging off the the back bring it up to 26'7". Now, one of our guiding RV principles has always been smaller is better; we're traveling in the smallest unit that we think we can live in. But as I've already mentioned, the new truck is a foot longer in the frame; that's unavoidable. Moving up to the Crew Cab (which has a real back seat) would add another 14" to the cab, and our total length would be 26'4", nearly as long as we are now even though the bikes have been moved inside. That feels like a step backwards to us, but if we can save $15k by doing so, maybe it's worth it - at least in the short term. We're back at Douglass first thing in the morning, and suddenly all the design hurdles evaporate like raindrops in the Bakersfield sun. Turns out the spare will fit happily in one of the standard utility body side compartments (they're taller than Diamond's, apparently). I love it when a plan comes together! Now, new truck or used truck? That's the question. With new, we can obviously get exactly want we want - for a stiff price. But our changing requirements mean that we can probably find a used truck that will do us for maybe half that price, and we can always trade up in a year or two if we're really dissatisfied with the compromises. Teresa has an inspiration about the SuperCab and the bikes: what if we turn the handlebars sideways? Sounds obvious, but then these things always do in retrospect. So we empty the back seat again to try it, and sure enough, the bikes fit. Just barely, but it's enough. One side effect of our minimal-RV lifestyle is that there's only just enough room for everything we carry; why should the bikes be any different? So now both cab sizes are open to us once again, but all the used trucks we can see are Crew Cabs. And eventually, the trade-up flexibility of a used truck wins out over new, along with the comfort factor of spending many thousands less. There are several here in SoCal that look like they fit the bill. Make that one in SoCal - a 2001 in Los Angeles. The other two fell apart under closer inspection, didn't even cover our even-shorter shortlist. So, after leaving the camper at Douglass for measuring by shop guru Jacob, we cruise south on Highway 99 into the heart of darkness. Two hours later we're at Carmenita Truck Center, inspecting the truck in question. Which, as it turns out, has apparently led rather a hard life; at under 50k miles, it has soft brakes, a mushy transmission, six bald and mismatched tires, and a power steering pump that downright howls. None of which (apart from the steering) the dealer is willing to fix, or even reflect in the price. To add to the insult, he seriously lowballs us on the trade-in value of our F-350. For a moment, we're tempted to buy it anyway - after deciding on used, this is our only option - but fortunately, a last minute snag with CA taxes delays the deal and we come to our senses. Make that none in SoCal. A positive surprise is waiting for us back in Bakersfield, though. Jacob has determined that we can shave the extra foot of truck length down to 5", essentially by hanging less of the camper off the back of the utility body. This means that if we put the bikes inside a SuperCab, our total length will be only 24'7". A nice bonus is that this puts the camper's center-of-gravity a few inches ahead of the F-550's rear axle; probably not crucial on a truck this big, but still a bit more comfortable to me. We're back in Jason Hooe's office at Jim Burke Ford, ready to talk seriously about ordering that 2004. A bit inexplicably, he's now working from the invoice price, some $6000 below the retail numbers he was giving us a week ago. We're surprised but not unwilling, and a deal is soon struck at $800 under invoice (including a $1000 upfitting rebate, but not including any other rebates that may be in place when we take delivery). Wow, that was remarkably painless. Thanks, Jason! And by the way, what will you give us for our trade? Oops, spoke too soon. Their used-vehicle manager takes our old truck out for a test drive, then hits us with a figure every bit as low as Carmenita had. It turns out that it's the 6-8 weeks for delivery that's part of the problem; he can't say what our old truck will be worth in two months when our new one is ready and we actually make the trade. So he's presented us with a "worst-case" figure, that the trade-in value will be "no lower than" this really low number. OK, at one level I can understand that, but on our side of the desk we need a realistic number we can rely on before we can know if this deal's going to work for us. Serious haggling ensues, and we finally get him to agree to different terms: a number relative to the "blue-book" value of our truck in two months, which will reflect additional miles driven, the passage of time, etc. That's the good news; the bad news is that the number in question is still $1800 below book value, and he won't budge on it. We feel ripped off, frankly, and we feel taken advantage of, but we also feel our back's against the wall here - what other option do we have? We need an F-550, but we can't get one used, and we have no reason to believe that any other dealer will give us any better deal overall. Heck, Jason's final price on the 550 is pretty good, it's just the trade-in. But we've been hit with low numbers twice now - what if that's what our old truck is really worth here? Or is this just the standard used-car-dealer BS? Either way, can we really afford to do this? In the end, we decide (as we have so many times before)� heck with it, let's do it. At 8:30AM, Bob presents us with the final body design. Bottom line is $7882.90. At 10:00AM, Jason takes our deposit on the truck order. The deed is done. It's been a month, so I e-mail both Bob & Jason to see how things are going. Bob tells us "Things are moving along as planned" at Douglass, and wants to know when he can expect the truck. Finally, a date! Jason e-mails us that Jim Burke Ford should take delivery on October 25th. It's time for us to start heading back toward Bakersfield. We write back to ask, when will the truck be ready for Douglass to begin putting the body on? Bob has very kindly sent us photos of our utility body in progress, and we're inordinately excited - it's the first tangible step we have. Here they are; looks a bit rough at this stage, but that's to be expected. The important thing is, every visible design aspect appears correct. If you look closely, you can even see my name on it! He also says he'll get in touch with Jason to arrange delivery. Good man, Bob. Finally we get to phone coverage, and are able to call Jason, only to be told - the truck is in! And will be delivered to Douglass this very afternoon! Woo hoo! In related news, it transpires that my work will require me to be in Denver the week of November 10th. Ideally, the new truck will be ready for us to drive it there. This earlier-than-expected delivery date gives us reason to hope it might be so. Numerous e-mails exchanged with Bob bring our hopes back in line with reality. It sounds as though Nov 7 (the date we'd need delivery to make it to Denver) is a long shot. Ah well, such is life. 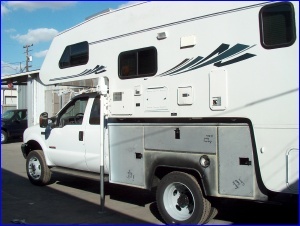 We do, however, set dates for the "fittings" between camper and utility body - and we get more (and higher-resolution) photos! We have made our way back to Bakersfield for the first "fitting" of camper to truck - and, not incidentally, our first look at our new ride. We arrive at Douglass to find the still-unpainted body already attached, at least provisionally, to the truck. Drool drool� Bob has us detach the camper from our F-350, then takes us to lunch as Jacob gets started with the fitting. We spend most of the rest of the afternoon just hanging about while Jacob finishes his measurements and finalizes the fitment details. "Hanging about" isn't quite right, actually; "fawning over our new truck" is probably more accurate. We try out the seats, we gaze at it longingly, I look underneath & pop the hood, Teresa even starts it up. Our only complaint is the gray steel wheels it comes with by default; anyone know where we can get a deal on 19.5" stainless-steel wheel simulators? Bob and Jacob are very patient with us, and eventually the camper is back on our old truck and we say our goodbyes. Final fitting is set for Monday. And we thought we were eager before! After a flat tire on the old truck over the weekend, we return to Douglass for what we hope will be the last fitting of camper to utility body. We get the tire replaced while Jacob is doing his doings, but the big question of timing is never far from our minds. I need to be in Denver one week from today. Will the new truck be ready? So we've set off for Denver in our old truck. What else could we do? But in the middle of Utah, halfway down the 3000-foot San Rafael Reef, the F-350's transfer case gives up the ghost. Fortunately, we're in one of the few places in rural Utah that has a bit of cell phone coverage, and our insurance's Roadside Assistance plan is called upon. 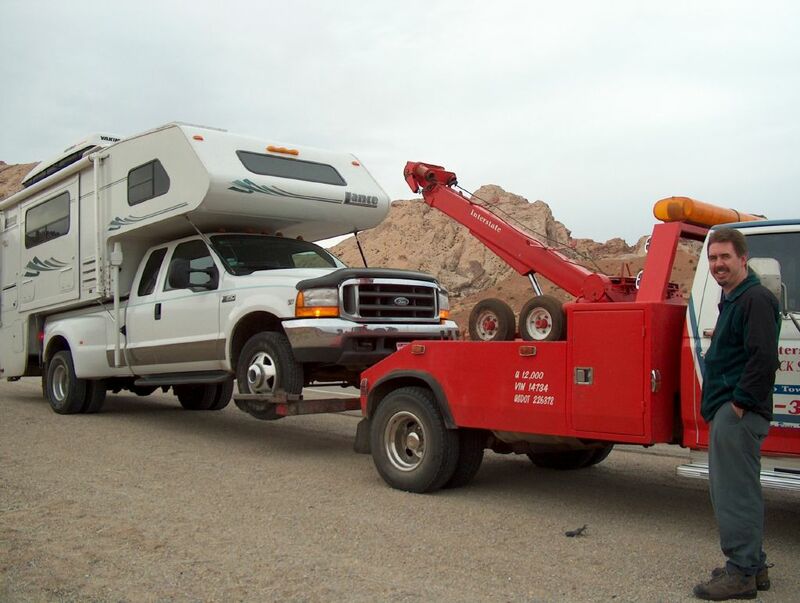 Best $4/year we've ever spent - within the hour Bo of Interstate Towing shows up, hoists our rig onto the back of his old F-450 (really! ), and pulls us into Green River. I can't get out of my mind that if Bob had stuck to the 6-8 week schedule he quoted ten weeks ago, this wouldn't have happened to us. Bo at least can deliver on schedule, and before noon we're on the road again, a shiny new transfer case under the truck, wallet a couple thousand bucks lighter. Ouch. My meetings in Denver have gone well, and we're almost ready to start west again. Before we left Bakersfield a week and a half ago, Bob promised photos of the truck as soon as it was completed - but we've heard nothing. So I call him, and he says he'll check on it and get back to me. An e-mail from Bob arrives saying the truck will be completed by the time we return on Wednesday. Teresa and I have a lingering suspicion that they don't actually work on it when we're not in (or approaching) Bakersfield. An unexpected last-minute delay has kept us in Colorado a few extra days, but at long last we have the good news from Bob: The Truck Is Done. Twelve weeks to the day from when we ordered it, but who's counting? At least he sent photos - and I have to say, it looks pretty damn good. Tomorrow we're setting off toward Bakersfield again, for real this time. I can't let go of the hope that we can still take delivery before Thanksgiving. We have our first in-person look at the completed beast, rummaging through all the compartments and asking Bob a few questions while it's still parked in Douglass' yard. There are a couple of minor issues yet to be straightened out, but overall it looks as good in person as it did in the photos Friday. He promises to have the last items finished this afternoon, and the truck ready to go first thing tomorrow morning. So we go directly over to Jim Burke Ford, skirting the huge sinkhole that appeared right where we parked the last time we were here, and meet with Jason again. He and someone from their used car department test-drive our F-350 again - we cleaned it last night just for this occasion - and proceed to offer us about a thousand dollars more than we'd been expecting them to based on our last visit. Wow. Another nice bonus is that Ford has recently upped their SuperDuty rebates to $1500. But apparently the guy who needs to finalize the pricing is gone for lunch, so Jason will call us later with the numbers. Three phone calls later: We're not sure if we still qualify for one of the rebates we had, but Jason has come up with another $1000 of Ford "Bonus Cash", and is suddenly talking about us being able to have the truck tomorrow afternoon. Up 'til now, we thought he'd need a full day for his Pre-Delivery Inspection, so we'd take delivery the day after he got the truck back from Douglass - meaning Wednesday. This is also remarkable due to the Nevada factor. You see, California has something like 8% sales tax, and unlike most states they collect it when you buy a vehicle, not when you first register it. But you can legally avoid it by taking delivery out of state. This is apparently common enough that car dealers here regularly deliver vehicles to Nevada, four hours away. We'll still have to pay our domicile state of South Dakota its 3% tax, but that's nonetheless a 5% savings, substantial on a truck this pricey. Obviously, this adds yet another dimension of complexity to the whole process. But Jason's adamant that tomorrow is doable, and I'm happy to believe it. When I call him back about 4:30, he says that he has just picked up the truck, and we're on track for tomorrow. We arrive at Jim Burke half an hour early, before the paperwork is even done, and everything just sortof falls into place. In the end, we have done really well by them, despite the bad taste their used car department initially left us with. And all the rebates they've found for us add up to $3500, not bad at all! By 10AM we're on the road for Nevada, and by 3PM we've done the deal, exchanged trucks in a casino parking lot just over the state line. I love that, it sounds so ilicit. The only way it could have been better is if it had happened under cover of darkness. So the F-550 is finally ours! First impressions are extremely positive, this thing drives like a completely different truck. ;^) We have virtually no body roll when cornering, the 6.0 liter diesel feels really strong - though I'm restraining myself until it's broken in - and the TorqShift transmission's Tow/Haul mode is nothing short of amazing. This truck is everything we'd hoped for. Now the bad news� It turns out that Douglass has seriously munged the wiring of the camper's electrical connection. We made it about 10 miles up the road before we realized this, and now we're stuck in a different casino's parking lot for the night rather than go on with no turn signals, taillights, brake lights, etc. 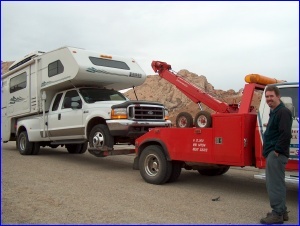 What happens is, using the brakes or either turn signal makes EVERY light on the camper come on. In Teresa's words, "It's like Christmas back there!" We're hoping that the camper's electrical systems haven't been damaged, but it's too soon to tell. I'm going to crawl under the truck and have a look at redoing it in the morning. I understand that their shop guys aren't electrical specialists, that's fine. What I realize is that I'm less bothered by the fact that they couldn't do the wiring than by Bob telling us that they could. Nonetheless, the truck - and the saga - is nearly complete. Well, a couple of hours scrabbling around under the truck with cutter & crimper, and our camper lights are fine now. 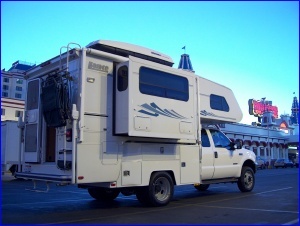 Douglass did offer to pay for the repair if we took the camper to a dealer here in Nevada, but there's no telling how long that would have taken. They also admit to having done it wrong: they simply matched up the wires color for color, even though we had supplied them with a wiring diagram for the camper plug. I think what really ticks me off about it is that they're the same four circuits the lights on their utility body use, and they managed to do those correctly. I can see I have more work to do under there at some point as well; Douglass used what looks like 12-gauge wire for our charging connection. I'll bet we can get another hundred amps to the camper by replacing that with 2-gauge and shortening the ground run. But enough about wiring. The important news is that we put about a hundred miles on the new truck today, and we couldn't be happier with it! The difference between being 2500 pounds over our GVWR with the old F-350 and being a similar amount under with this truck has to be felt to be believed. We are dashing in and out of parking lots, cornering without slowing to a crawl, and I passed a tractor-trailer at 60MPH on the inside of an uphill turn. All unthinkable before today - what we realize is that this truck, with the camper on board, drives almost like our old one did when empty. We may have had occasional doubts during the past four months about what we were doing, but they're all gone now. This upgrade was absolutely the right thing. Well, I think I can finally bring this article to a close. Although we will no doubt be tinkering with minor tweaks and accessories for some time yet, the truck is essentially done. There's a lot more to say about the F-550, but this journal has really been about the process, not about the truck itself. Look for a full technical writeup soon!